This past week we attempted to get a family photo for a Christmas card. Last year we didn't send one because I was about to pop Otto out of my womb and mailing Christmas cards was about the last thing on my mind. So this year, we thought, we'd make up for it with a super cute card! Have everyone dressed in plaid! Show our cute smiling boys who are growing like weeds! Yeeeeeeeah... We honestly took no fewer than 300 photos over a span of an hour and a half (complete with snack breaks for the boys). And we got ONE good one. Right at the very end. But all was not lost! That means we had tons of amazing outtakes. 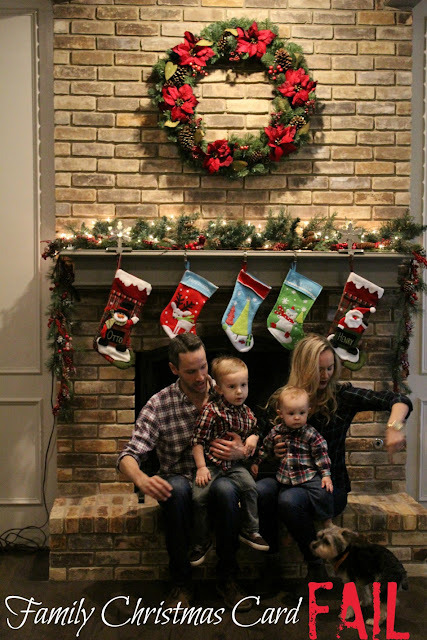 Here, friends, is the story of our Christmas card fail. Our plan was to have hubs' parents use my DSLR and get a nice shot. We even pulled out just enough of our Christmas stuff to set the scene (don't worry, my house isn't decorated just yet). But dangit if Dallas didn't decide to monsoon for my in laws' entire trip. Which meant no natural light. So we turned on every single light we had, and I set my camera to auto-focus and wouldn't you know? The light was so low it wouldn't take a shot! So I went back to manual, increased the ISO and lowered the shutter speed (which you never want to do with kids - you'll never get a crisp shot!) and we ended up with these grainy pics. Enjoy. As you can tell, the kids were thrilled about this. Otto looks outright terrified. Then the baby attempts to bolt. He's had enough of this nonsense. We thought standing might be better. The kids thought otherwise. Then I realized Henry's face is covered in my bright red lipstick. And it won't come off. After realizing that the light situation was just not going to work, we attempted some iPhone pics. They were no better. So when the rain stopped for a few minutes, we ran outside in attempts at some natural light! Hubs and I put on brighter shirts to try to "lighten it up" too. As if a shirt can make a picture brighter... But who needs logic, right? We only needed a decent picture, logic be damned. Henry was really getting into saying "CHEESE!" Otto was entirely unamused. And this, friends, was the best we could do. Otto and Henry are in on the midriff-baring trend, obvi. I knew it was going to be hard to get a decent photo of all of us, but I didn't think it would be THAT hard. I mean, we're all decent looking, you'd think we'd be more photogenic. But dang, that Christmas card pic struggle was real. We family Christmas card failed so hard this year. Love the outtakes. I feel like last year was a sh*t show but this year, I'm on the ball. The lipstick all over Henry is awesome. LOL! LOL those are great! I feel your struggle, I have 4 kids and 3 dogs that I try and put in our photos every year. This year we are all wearing PJ's and I could care less what everyone is doing in the pictures, because at this point I just want it done. Plus 2 of my kids are adults and 2 are teens. You would think they would be more cooperative, but they aren't. In fact they behaved better for pictures when they were toddlers! Hahaha! I love the outtakes. Trying to get good family photos is definitely a challenge.